In this First Week of Lent St Augustine gives us something worthy for our reflection: In Christ we suffered temptation, and in him we overcame the devil. Hear, O God, my petition, listen to my prayer. Who is speaking? An individual, it seems. See if it is an individual: I cried to you from the ends of the earth while my heart was in anguish. Now it is no longer one person; rather, it is one in the sense that Christ is one, and we are all his members. What single individual can cry from the ends of the earth? The one who cries from the ends of the earth is none other than the Son’s inheritance. It was said to him: Ask of me, and I shall give you the nations as your inheritance, and the ends of the earth as your possession. This possession of Christ, this inheritance of Christ, this body of Christ, this one Church of Christ, this unity that we are, cries from the ends of the earth. What does it cry? What I said before: Hear, O God, my petition, listen to my prayer; I cried out to you from the ends of the earth. That is, I made this cry to you from the ends of the earth; that is, on all sides. Why did I make this cry? While my heart was in anguish. The speaker shows that he is present among all the nations of the earth in a condition, not of exalted glory but of severe trial. Our pilgrimage on earth cannot be exempt from trial. We progress by means of trial. No one knows himself except through trial, or receives a crown except after victory, or strives except against an enemy or temptations. The one who cries from the ends of the earth is in anguish, but is not left on his own. 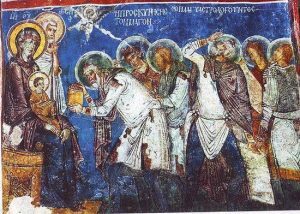 Christ chose to foreshadow us, who are his body, by means of his body, in which he has died, risen and ascended into heaven, so that the members of his body may hope to follow where their head has gone before. He made us one with him when he chose to be tempted by Satan. 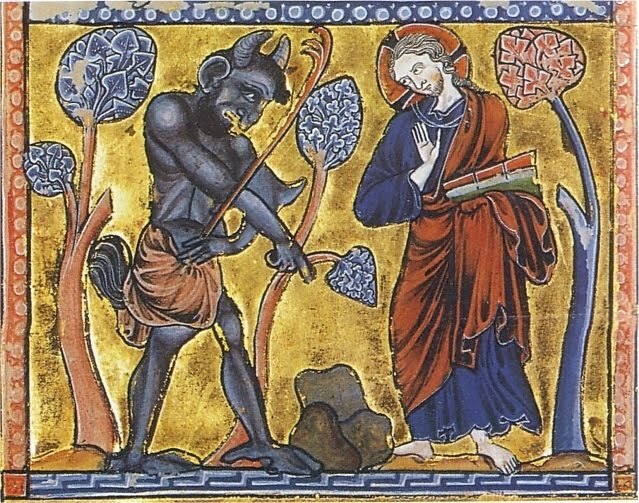 We have heard in the gospel how the Lord Jesus Christ was tempted by the devil in the wilderness. Certainly Christ was tempted by the devil. In Christ you were tempted, for Christ received his flesh from your nature, but by his own power gained life for you; he suffered insults in your nature, but by his own power gained glory for you; therefore, he suffered temptation in your nature, but by his own power gained victory for you. If in Christ we have been tempted, in him we overcame the devil. Do you think only of Christ’s temptations and fail to think of his victory? See yourself as tempted in him, and see yourself as victorious in him. He could have kept the devil from himself; but if he were not tempted he could not teach you how to triumph over temptation. Here we see the root of our life: The Lord in His Life-Giving sacrifice shows us the relationship between His infinite mercy, justice and His love. We participate in Lord’s kenosis inviting us to assent to deification in the Life of the Trinity in a synergistic way. 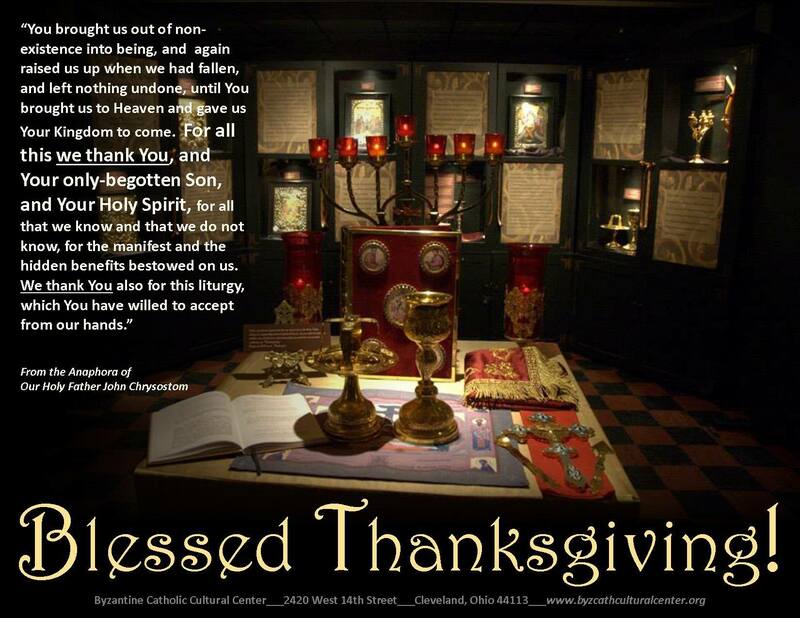 This is our sacred, divine Liturgy. 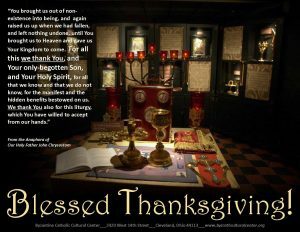 to you, my God, I give thanks for your gifts. Do you preserve them for me. Augustine of Hippo was an early Christian theologian and philosopher whose writings influenced the development of Western Christianity and Western philosophy. Aurelius Augustinus was born in 354 in Tagaste (modern-day Souk Ahras, Algeria) to a Christian mother and a pagan father, raised in Roman north Africa, educated in Carthage, and employed as a professor of rhetoric in Milan by 383. He followed the Manichaean religion in his student days, and was converted to Christianity by the preaching and example of Ambrose of Milan. He was baptized at Pascha in 387, and returned to north Africa and created a monastic foundation at Tagaste for himself and a group of friends. 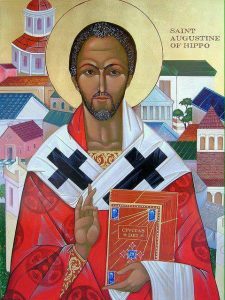 In 391 he was ordained a priest in Hippo Regius (now Annaba, in Algeria). He became a famous preacher (more than 350 preserved sermons are believed to be authentic), and was noted for combatting the Manichaean heresy. In 396 he was made coadjutor bishop of Hippo (assistant with the right of succession on the death of the current bishop), and remained as bishop in Hippo until his death in 430. He left his monastery, but continued to lead a monastic life in the episcopal residence. He left a Rule (Regula in Latin) for his monastery that has led him to be designated the “patron saint of Regular Clergy,” that is, parish clergy who live by a monastic rule. 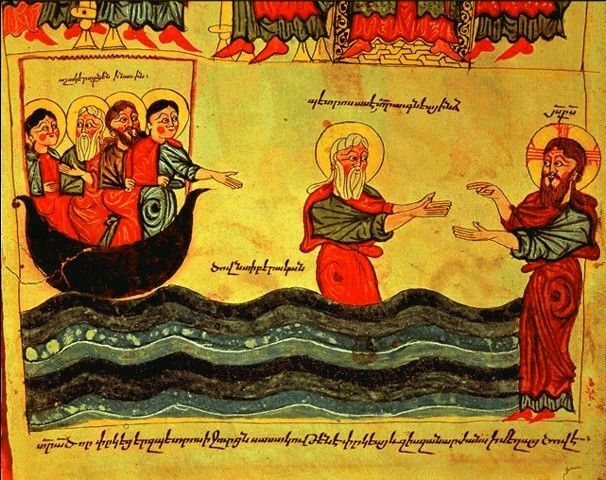 Today, on the 19th Sunday through the Church Year, we hear the gospel reading where Jesus walks on the water. We are moving through the summer…and what the Church gives to us to meditate upon is keen these days. You would have suffered eternal death, had he not been born in time. Never would you have been freed from sinful flesh, had he not taken on himself the likeness of sinful flesh. You would have suffered everlasting unhappiness, had it not been for this mercy. You would never have returned to life, had he not shared your death. You would have been lost if he had not hastened to your aid. You would have perished, had he not come. For this reason, when our Lord was born of the Virgin, the message of the angelic voices was: Glory to God in the highest, and peace to his people on earth. For what greater grace could God have made to dawn on us than to make his only Son become the son of man, so that a son of man might in his turn become the son of God?